December is a month filled with reasons to have great gatherings with great opportunities to have some indoor family fun. What better time to have some fun, then when ringing in the New Year? Here are some great ideas you might want to try! 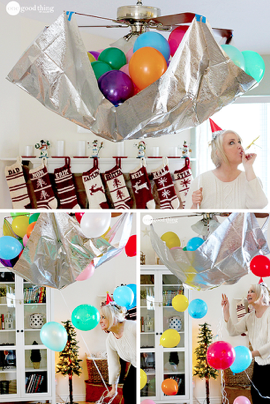 Just like all the big celebrations you see on TV, you too can have a balloon drop to recognize the New Year. All you need to do is purchase a plastic tablecloth, cut it into four pieces, use a little bit of masking tape to put it back together and then tape the corners to the blades of the fan. Once it’s attached, you can fill it with balloons. Be sure to have a string tied to the center of the tablecloth that will pull the pieces apart, releasing the balloons. Why mess with fancy flower arrangements as a centerpiece when you can use these simple and inexpensive noisemakers. You can buy ones of different sizes or cut some down to find your desired height. Make it an indoor family fun activity the whole family can enjoy! Even the ice that keeps all the drinks cold at your Caliterra in Dripping Springs New Years Eve party can be given an extremely festive twist! All you need is to purchase some edible glitter in the cake section of your local craft or grocery store. For the perfect glitter ice cubes, you’ll want to freeze the ice cubes like normal (without glitter) then remove them from the freezer and wait for them to melt a little bit. After that, simply dust them with the glitter and then refreeze them. Your guests will love it and your drinks will be festive! These are just a few great ideas, and you can check out even more ideas here. If you have other cool indoor family fun ideas to ring in the New Year, be sure to tell us all about it on our Facebook and Twitter pages!